Garlic health benefits and medicinal properties have long been known. Garlic has continuously been considered a herbal “wonder drug”, with a reputation for preventing everything from the common cold and flu to the Plague! It has been used extensively in herbal medicine. If garlic had been created in the laboratory instead of by nature, it would probably be a high-priced prescription drug. Garlic has been used throughout the centuries, for treating various illnesses. The most important and unique feature is its high content of organo-sulfur substances. Garlic contains at least four times more sulfur than other high sulfur vegetables such as onion, broccoli and cauliflower. Most important for the taste is allicin, which is produced enzymati­cally to sulfur. If the garlic cells are damaged; its biological function is to repel herbi­vorous animals. Allicin is deacti­vated therefore, minced garlic changes its aroma if not used immediately. In general, a stronger tasting clove of garlic has more sulphur content and hence more medicinal value. Fresh cloves contain an antioxidant compound that gives garlic its characteristic aroma, which may explain why garlic may be helpful for reducing blood clots and artery plaque and modestly lowering cholesterol. When eaten daily along with other heart-healthy foods, garlic can help lower heart disease risk by 76 percent. Garlic’s blood-thinning properties are helpful, but if you’re already taking a blood-thinning drug such as Warfarin (Coumadin), or you have a blood or platelet disorder or are going into the hospital for surgery or to have a baby, talk to your doctor before consuming large amounts of garlic. Garlic’s antibacterial and antiviral properties, due to the sulphur content make it a superb treatment for coughs and other throat irritations. Garlic may also reduce the severity of upper respiratory tract infections. Garlic is considered to regulate blood sugar levels by increasing the release of insulin in diabetics. Therefore an effective remedy is to include garlic in your daily diet. Clinical studies have shown that people with high blood pressure who consumed garlic daily for up to five months lowered their blood pressure levels as effectively as patients taking prescription blood pressure drugs. It keeps the cholesterol levels in our blood in good balance. It does this by lowering serum cholesterol levels while raising ‘good’ HDL-cholesterol levels. Studies have shown that taking 600-900mg of garlic everyday lowers cholesterol levels and reduces arterial plaque formation by 5–18%. Therefore, an effective natural remedy is to include garlic in your daily diet. 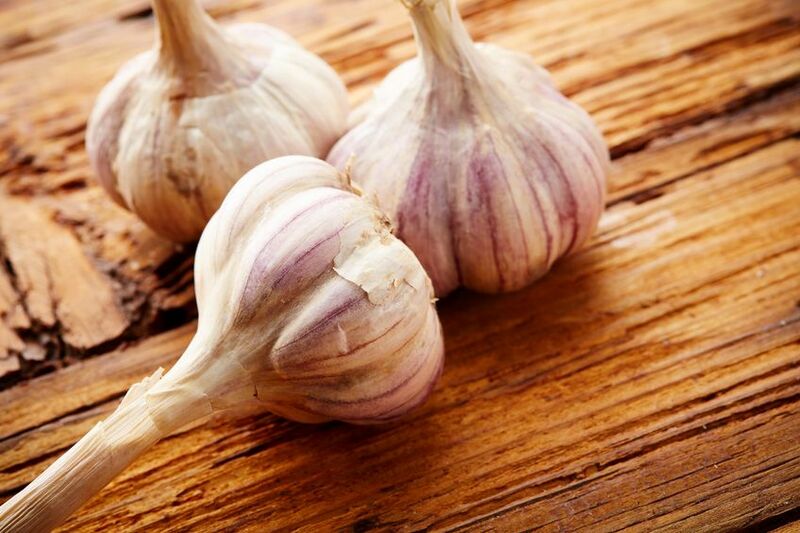 Garlic’s antibacterial, analgesic, and anesthetizing properties can help cure toothaches. Simply put some garlic oil or a piece of crushed garlic clove directly onto the affected tooth and the gum for instant relief. Garlic’s ability to fight infections and bacteria makes it an effective cure for warts and other skin problems. Take a fresh clove of garlic and cut its tip off. Rub the cut area of the clove directly onto the wart for a few seconds. Repeat this each night before going to bed until the wart disappears. If you feel any kind of irritation or strong burning sensation, simply rinse the area with water. Numerous case-control/population-based studies suggest that regular consumption of garlic (particularly unprocessed garlic) may reduce the risk of developing several types of cancer, including gastric and colorectal malignancies. Lau, a researcher at the Loma Linda University School of Medicine, has identified three ways garlic protects against cancer: by directly inhibiting tumor cell metabolism, by preventing the initiation and reproduction of cancer cells, and by boosting a person’s immune system to more efficiently fight cancer cells. John Milner, Ph.D., of Pennsylvania State University, University Park, recently studied how aged garlic powder protected against nitrosamine-induced cancers in laboratory mice. Nitrosamines are formed when processed meats, such as bacon and bologna are eaten. Garlic products are made from whole fresh garlic, fresh or dried garlic cloves, garlic powder made from the dried cloves, freeze-dried garlic, or oil garlic extracts. The usual daily oral dosage is 4 grams of fresh garlic or 8 milligrams of garlic oil per day, which is equivalent to approximately 18 mg of alliin (9 mg of allicin). For high cholesterol and hardening of the arteries, typical doses range from 600 to 900 milligrams daily. For high blood pressure, take 200 to 300 milligrams 3 times daily. Garlic oil can be made by crushing cloves and steeping in olive oil for one to two weeks. Refrigerate and use to massage into affected areas of arthritis, rheumatism, sprains, strains, and chest infections. The garlic oil will stay fresh in the refrigerator for up to two years. Not all garlic supplements have the same effect. As most regular supplements contain a mixture of alliin and the enzyme alliinase, which combine to produce allicin. If the capsule coating breaks open too soon, the stomach acid deactivates the alliinase enzyme, and the allicin is not produced. This means that there is no therapeutic effect. But, a novel type of patented technology means that a completely new group of garlic supplements, such as Allimax, can now be produced.